Born August 30, 1877 at Dresden, Germany, of U.S. parentage, he was one of the few U.S. flag officers not born on U.S. soil. His father was Rear Admiral Edward D. Taussig, a native of Missouri who took possession of Wake Island for the United States during the Spanish-American War. He graduated from the United States Naval Academy in 1899 and in a career that spanned more than forty years, he advanced from Ensign to Vice Admiral. During World War I he was commander of the destroyers USS Wadsworth and USS Little. More than a year and a half before the Japanese attack on Pearl Harbor on December 7, 1941, as commandant of the 5th Naval District, he told a Senate Committee that events in the far East pointed to eventual war with Japan. He cited the now famous Fanaka Memorial of 1927 as a blueprintof Japanese expansionist ambitions. His warning stirred up a hornet's nest in Washington and the Navy Department was quick to repudiate his "poor judgement." Three months before Pearl Harbor, having reached the mandatory retirement age of 64, he was retired with the rank of Rear Admiral, a distinction rarely bestowed. Nevertheless his retirement was viewed as a reprimand for his statements to the Senate. Two years later, the outspoken old sailor was recalled to service when his country was engaged in bitter warfare with Japan. He died on October 29, 1947 at Bethesda Naval Hospital and was buried in Section 30 of Arlington National Cemetery. 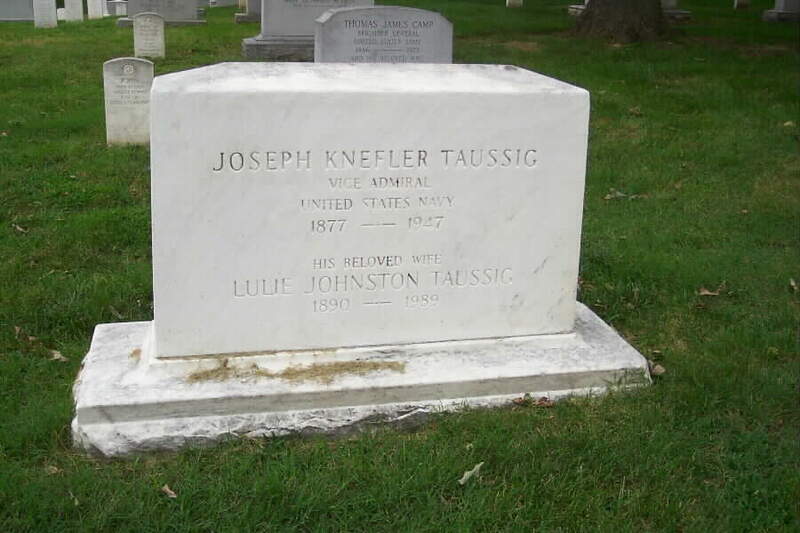 His wife, Lulie Johnston Taussig (1890-1989), is buried with him.